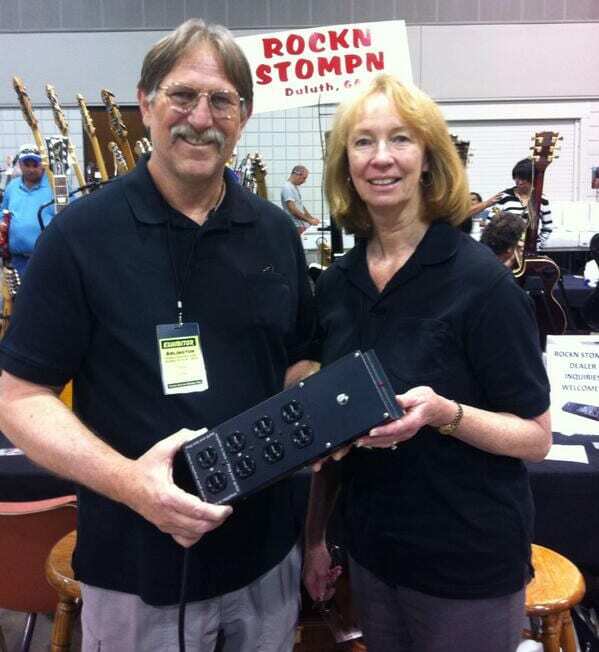 Kimball Magee, Rockn Stompn’s creator, talks about what inspired him to the create the ultimate power strip for musicians. People make mistakes. I know I make mistakes. Any amplified guitar player knows that “POP” that noise and what that mistake can mean to your speakers! In the 1980s I worked as an OEM electronic component salesman for a multi-line manufacture rep agency that represented SL Waber Electronics the leading and largest manufacturer of power strips in the United States. During that time, at a sales meeting Waber was introducing a series of new products. One of those products was power strip with a 12 hour mechanical timer built into one end. At the time, I remember thinking you could easily replace the timer with a push button switch and create a power strip you could turn on and off with your foot. I ended up keeping that sales sample for thirty years in my basement waiting on me to put the switch in it. In 2005 I injured my back to the point I required pain medications. This injury greatly inhibited my ability to function including playing my guitar. I couldn’t even really bend over. I was using my toe to turn on the rocker switch on the power strip that contained my guitar amp. Then I remembered that idea for a power strip with push button foot switch. Luckily, I never throw anything away. I went into my basement and found that power strip, took out the timer, and installed a sales sample push button switch, the same switch we use today. Just like that, I made the first Rockn Stompn power strip.It worked perfectly powered up all my gear, pedals, amp, everything. I was extremely happy. Then I made a mistake. I tapped my foot onto that push button switch to turn off my gear and “POP”, scared me to death, I thought I blew my speaker. Then I remembered that rule that “LAST ON FIRST OFF”. I should have turned my guitar amp off first. That’s the moment when I started a four year quest to design the ultimate power strip for musicians.